A champagne coloured bedroom stool with black seat pad. 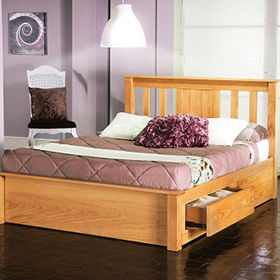 The Chateau Bedroom Range has pale yellow/tan 'champagne' coloured semi-gloss frames with solid oak trims & knobs and is ideal furniture for all bedroom styles. The Chateau Dressing Stool can be used with the Chateau Single Mirror & Dressing Table to make a bedroom vanity set. Delivered assembled in 2-3 weeks.